The Mighty Crusaders. It seems like every company that has superheroes, has an organization for them to join. King Features Syndicate has had superheroes since the 1930s. So why did it take until the '80s before King launched a superhero group? Maybe it's because they ran into credibility problems, trying to team up Flash Gordon, The Phantom and Mandrake the Magician on an ongoing basis. An interplanetary sci-fi adventurer, a jungle hero, and a guy based in contemporary America — come on, why not throw in Popeye the Sailor and Prince Valiant? They belong to King Features too. Come to think of it, they did meet Val in a time-travel episode. But they seem to have forgotten Popeye. Defenders of the Earth debuted not as a newspaper comic strip, which is where most King Features toons started, but as an animated TV show. The setting was the year 2015, when Flash's old enemy, Ming the Merciless, was about to invade Earth. Flash enlisted Mandrake, Lothar (Mandrake's manservant, promoted to full-fledged adventurer here) and The Phantom to help repel him. For enhanced kid appeal, they were joined by a new generation of heroes — Flash's son Rick Gordon, Lothar's son L.J., The Phantom's daughter Jedda Walker, and an orphan named Kshin, who'd been hanging around with Mandrake. As a surrogate dog, they threw in Kshin's pet alien, Zully. Lothar's promotion and the addition of offspring weren't the only differences between these characters and their comic strip counterparts. For example, Mandrake's powers were upgraded from mere hypnotic suggestion to real magic. By far, the most immediately noticeable change was in Ming — when first seen, in 1934, he was distinctly Asian, done up to look like Fu Manchu. In this version, to avoid stereotypes, he was colored green. The show was a joint production between King Features and Marvel Productions (formerly the DePatie-Freleng animation studio, where The Pink Panther and Super President started). It began in syndication on September 8, 1986. Voices included Pete Renaday (also heard in Darkwing Duck, Teenage Mutant Ninja Turtles and elsewhere) as Mandrake, Lou Richards (Galtar & the Golden Lance, Mighty Orbots) as Flash and William Callaway (DuckTales, My Little Pony) as Ming. It lasted only one season. 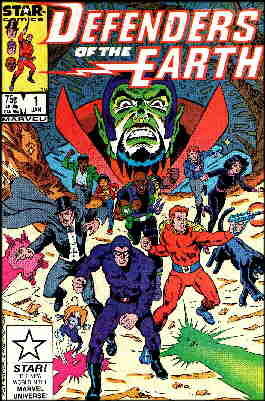 The comic book adaptation, published by Marvel with a first issue cover date of January, 1987, lasted only four issues. But video games based on the series have had some success — maybe the people playing them don't realize, or don't care, that their grandparents used to read about these characters in the Sunday papers. Maybe not realizing, or not caring, is also why they so readily accept a team made up of such disparate characters. Text ©2002-08 Donald D. Markstein. Art © King Features.